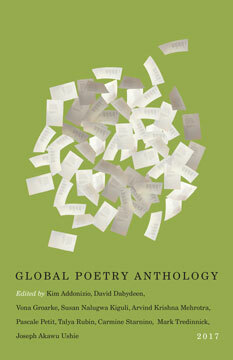 Global Poetry Anthology 2017 is a one-of-a-kind collection of contemporary previously-unpublished poems gathered from all corners of the English speaking world. An international editorial board ensures the present volume's cosmopolitan palette, and the "blind" selection process guarantees that choices have been made according to poetic calibre alone. Vehicule Press's Signal Editions is proud to offer the third volume in the Global Poetry Anthology Series--a rich and exciting mix of established and emerging voices. Kim Addonizio is the author of six poetry collections, two novels, two story collections, and two books on writing poetry. She has received fellowships from the NEA and Guggenheim Foundations, two Pushcart Prizes, and was a National Book Award Finalist. David Dabydeen has won the Quiller-Couch English Prize and the Commonwealth Poetry Prize. He is a professor at the University of Warwick, and Guyana’s Ambassador for UNESCO. He is a Fellow of the Royal Society of Literature and has received many awards including the Hind Rattan Award and the Anthony N. Sabga award. Vona Groarke is the author of seven collections of poetry. Her poems have appeared in The New Yorker, The Guardian, Poetry and many more. She teaches at the University of Manchester and is the editor of Poetry Ireland Review and selector for the Poetry Book Society (U.K.). Susan Nalugwa Kiguli is an academic and poet. She was the African Studies Association Presidential Fellow 2011. She has served as the chairperson of Uganda Women Writers’ Association, and she currently serves on the Advisory Board for the African Writers Trust. Arvind Krishna Mehrotra has published five books of poems, and two of translation. Among the books he has edited are the Oxford India Anthology of Twelve Modern Indian Poets and A History of Indian Literature in English. He lives in Dehradun, India. Pascale Petit is the author of six collections of poetry. She won the Manchester Poetry Prize and was shortlisted for the Wales Book of the Year and four times for the T S Eliot Prize. As well, she is the recipient of a Cholmondeley Award. She lives in the UK. Talya Rubin is a writer and performance maker. Her poetry won the Bronwen Wallace Award for Emerging Writers and was short-listed for the Winston Collins/Descant prize for Best Canadian poem and the Montreal International Poetry Prize. She runs an interdisciplinary performance company and currently lives in Montreal. Carmine Starnino is the author of five volumes of poetry and two collections of literary essays. His work was nominated for a Governor General’s Award and the Pushcart Prize. He is the poetry editor at Véhicule Press and senior editor at Walrus Magazine. He lives in Toronto. Mark Tredinnick is a poet, nature writer, writing teacher, and memoirist. Winner of the 2011 Montreal Poetry Prize, and of the 2011 Cardiff Poetry Prize, he is currently the poet in residence at the Sydney Botanic Gardens. He lives and writes along the Wingecarribee River, southwest of Sydney. Joseph Akawu Ushie is a Fellow of the 2002 Fulbright Program and his State Government’s Honouree for outstanding contributions to the growth of African Literature and Culture. His poetry has been widely anthologized. He lectures at the University of Uyo, Nigeria and has been a Visiting Lecturer at the Niger Delta University and at the Omar Bongo University, Gabon. 94 pp 8.5" x 5.5"